I have been in love with my husband for nearly 10 years. Sure we met a little over 10 years ago, but who really loves someone at first sight? My attraction towards him blossomed into love about this time one decade ago. I remember telling him in the early part of April of 2005 that I wanted to commit to only dating him (not that I was dating anyone else anyway). I was falling for this man who was so kind and caring. He had patience for my open wounds from my first marriage, he clearly loved God and sought to make Him first in his life. It’s easy to say my love for him has grown greatly over the years of marriage and children but it hasn’t just happened by time or circumstance. We haven’t simply decided to keep on loving even when it was hard. We haven’t simply stood on our vows and hoped that it would get us through. We haven’t even just pressed into the Father to see us through the yuck of life. These are good things and I know they have played a part in strengthening our marriage. The area I want to share with you is one I would give a great deal of credit. It is one that is hard to step into and is uncomfortable to dwell in. Not the sexual kind. (That is super important too and I want to write more on that in the future). Intimacy has an immediate draw to the physical but what about emotional intimacy? Recently, a season of unrest began to build in our marriage. I can’t even tell you how it began. Like a leak in a pipeline (I’m sure it was a tiny drip at first), a snarky comment made on a bad day, or a wrongly perceived intent behind an action. You know, the tiny, little thing that keeps happening and before you know it, you are anticipating it and so ready to pounce that it seems the other was doomed before they even walked in the door. Well, this is where we were. I didn’t feel safe to be real. I felt the tension between us in small amounts all the time and in big amounts more frequently than I had in the past. At that time, our emotional intimacy had all but vanished. I was in self-preservation mode. I was on the defensive 24/7 and he would probably say he felt the same where I was concerned. I think all couples go through this from time to time. We weren’t fighting a lot but more than normal for us. Even though I couldn’t tell you what caused this to come on, I knew what we needed to do to fix it. I needed to tear down the walls and show him my heart. I didn’t feel safe enough to do this on my own so I enlisted the help of a dear couple we know love us equally and are for us and our marriage*. *Important note here. I did not go to a girlfriend and talk about him and what he was doing. I went to a trusted couple that is trained in spiritual connections and marriage enrichment. They were not on Team Ashley. They are TEAM Jesus and cheering for Team Ferris. They sat with us for THREE hours as we hashed out what was going on and helped us get to the root of it all. This was intimacy: Being authentic and sharing my heart. He shared his as well. We got biblical perspective from two people who were not emotionally charged with relational pain. At the end I felt like I was standing on top of a pile of rubble as my walls had collapsed around me. I was holding my husband and feeling safe in his arms. We both had lies to break away from and truths to declare over the other person. Looking him in the eye and telling him what I know is true about him is intimacy. Hearing him say things he knows to be true about me is intimacy. Intimacy is vulnerability, whether it is in the physical or emotional form. 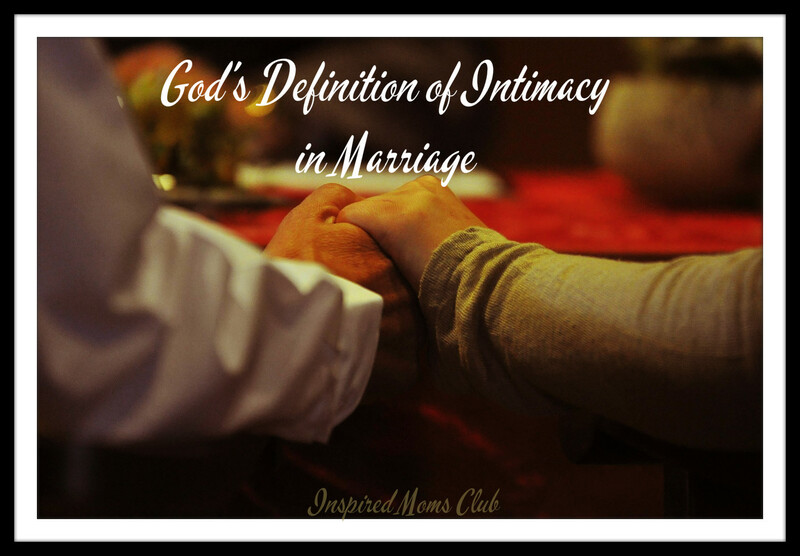 God invites us to explore both kinds of intimacy with our spouse. You should be most intimate with your spouse (as opposed to anyone else) on both levels. If you are struggling with either of these areas, I urge you to seek Holy Spirit’s divine wisdom on ways to go further. Emotionally, I encourage you to ask Holy Spirit what he thinks of your spouse. Listen and write it down. You may feel inclined to share, and you may not. But I imagine hearing the love that God has for your spouse will help you to see them through a new lens. I can wholeheartedly say spending time praying for my husband has radically changed my emotional connection with him. Not that God would change him or help him overcome ______. I pray favor over him and that he would receive the vision for our family and I would see him as God sees him. I ask for better ways to love him and I listen to what God reveals in that prayer time. I also ask for deeper intimacy in all areas of our marriage. God is for your marriage and for greater intimacy! This is beautiful, Ashley. Thank you so much for sharing your heart with us. I love that your prayer is for him to be the man God desires him to be not for the man you want him to be. Praying this way for our spouses and our marriages is just another wonderful way to build intimacy in these relationships. Blessings to you and yours for many more years of happy, intimate marriage. Found this really helpful – thank you for sharing such personal struggles – I need the Holy Spirit to speak the words that he sees about my husband to me.